Victor/Victoria was a Broadway musical with a book by Blake Edwards, music by Henry Mancini, lyrics by Leslie Bricusse and additional musical material (music and lyrics) by Frank Wildhorn. Mancini died before he could complete the music, and Wildhorn was brought in to finish the score. The show is based on the 1982 film of the same name which was a remake of the 1933 German film comedy Viktor und Viktoria by Reinhold Schünzel. 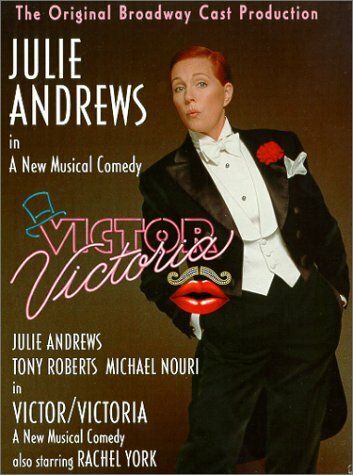 The show is about a penniless soprano, named Victoria, played by Julie Andrews, who colludes with a struggling gay impresario to disguise herself as a man named Victor, who entertains as a female impersonator known as "Victoria" - and as a result becomes the toast of Paris. Complications arise when a Chicago mobster sees the act and finds himself attracted to the star. A stage musical of the film didn't happen as planned immediately after the movie's release. Robert Preston, who played the gay impresario in the 1982 film, and Julie Andrews, who also was in the 1982 film, were meant to also star but then Preston pulled out saying there was no way the musical could be profitable. "It's just this big ego trip for Blake," said Preston. The musical finally did opened on Broadway at the Marquis Theatre on October 25, 1995, and closed on July 27, 1997 after 734 performances and 25 previews. The show was directed by Edwards and choreographed by Rob Marshall. The original Broadway cast included Julie Andrews in the title role, Tony Roberts, Michael Nouri, Rachel York, Richard B. Shull, Rob Ashford, and Greg Jbara. When Andrews received the her Tony Award nomination for the production, the only one the show received, she made headlines when she rejected the honor. She released the statement, "I have searched my conscience and my heart and find that I cannot accept this nomination." Andrews further stated that she would "stand instead with the egregiously overlooked" cast and crew. The incident stimulated ticket sales for the musical, and Andrews declined to perform at the Tony Awards ceremony, which suffered that year from a lack of star wattage. During Julie Andrews' four-week vacation in early 1997, Liza Minnelli took over the role. Later Andrews, who boasted a four-octave vocal range, was forced to quit the show permanently when she developed vocal problems. She subsequently underwent surgery to remove non-cancerous nodules from her throat and was left without a singing voice. Her lawsuit against surgeon Stuart Kessler was settled for $20 million. Andrews was replaced by Raquel Welch for the duration of the run. There was a First National Tour starring Toni Tennille, which ran from August 1998 through June 1999. Click here for more information on the original German version of this film from 1933 and a clip from the film. We previously did a post about the lyricist for that film, Bruno Balz. I'd completely forgotten about this being a musical, and am sure I hadn't known about the Robert Preston/Tony Roberts angle - nor of Liza M and Raquel Welch's taking over the Julie Andrews part. In this clip they've managed to make Julie A. more convincingly male-looking (well, nearer-convincing) than she looked in the film. I've only seen the film once (goodness me! was it really 35 years ago?) and always remember that dreadful line when she asks Robert Preston "How long have you been homosexual?". Blake Edwards (presumably) ought to have been ashamed of himself!